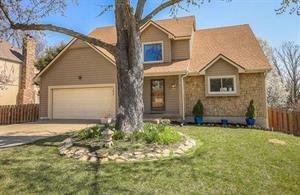 Cute, 1.5 story home in Lenexa close to College Blvd! Large walk-out basement has full bedroom and bath + workshop. Tons of updates throughout and unique features. Master bedroom and laundry on main floor. Beautiful laminate flooring in great room, dining room, and master. Gorgeous built ins. Large bedrooms on second floor and Google fiber ready! Adorable home on quiet cud-de-sac residing in the Blue Springs school district! The incredible tribute-level home features arched doorways, hardwood floors with tile inlays, and vaulted ceilings throughout. Large bedrooms with, separate living quarters in the fully finished basement with a 5th non conforming bedroom. Adorable home on quiet cud-de-sac residing in the Blue Springs school district! The incredible tribute-level home features arched doorways, hardwood floors with tile inlays, and vaulted ceilings throughout. Large bedrooms with, separate living quarters in the fully finished basement with a 5th non conforming bedroom. Beautiful four-bedroom, three bathroom California-split, features great hardwood floors, spacious great room, and finished, walk-out basement. Massive master bedroom includes gorgeous raised ceiling and access to private master bathroom, complete with double vanity, granite countertops, and walk-in closet. Kitchen comes with great wood floors, walk-in pantry and walks out to covered back deck overlooking spacious yard. Sub-basement offers plenty of space for storage.